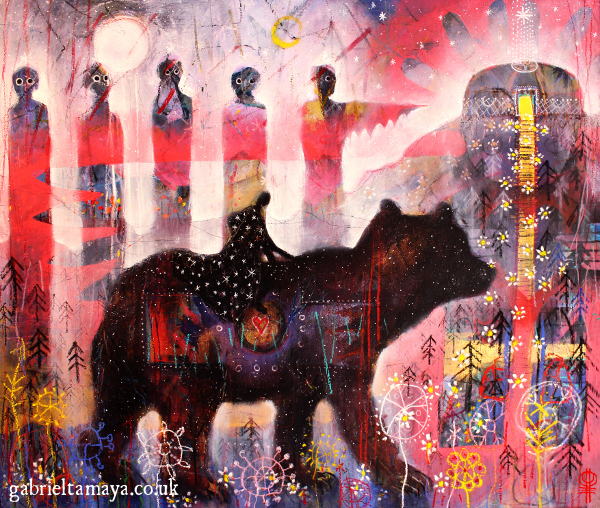 This painting maps some recent shamanic work and teachings I received around accessing and aligning with our ancestral power. That when we open up to this and invite it into our lives, truly fantastic changes become possible…we start to real-ise our true potential. Let us re-member and re-occupy what it means to be ‘human’! May it no longer be an excuse for mediocrity and playing small (‘…we’re only human’ they say), but stand for the blinding brilliance and unique magnificence that each and every one of us truly contain and is capable of! We are each capable of such amazing and beautiful contributions that are our lives, our unique offering to the world. Don’t wait for someone else to show you how, the time is now, the seeds are already within you! for the forgotten gods to return. The gods favour the bold! What are you afraid of…? It is time to awake and remember. as divine beings on earth. Size: 35 x 30″ (90cm x 75cm) approx. Gallery Prints are available here.